Rev. 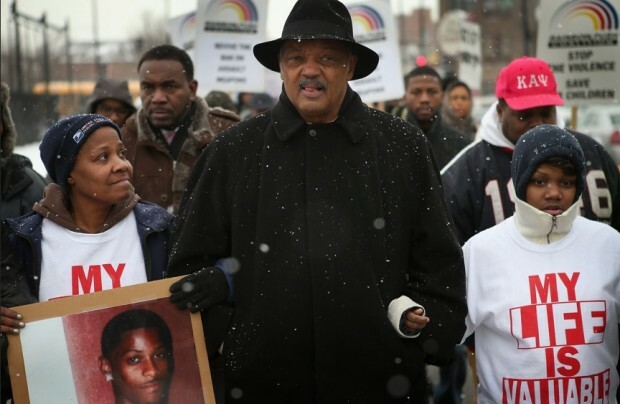 Jesse Jackson on Saturday called for the Department of Homeland Security to help patrol the streets of Chicago to deal with soaring gun violence in the city and for President Barack Obama to come and personally address the issue. Jackson was holding a rally and march in honor of Hadiya Pendleton, the sophomore honors student shot dead in a local park days after performing at Obama’s second inauguration. Jackson said Chicago needs more help than either Mayor Rahm Emanuel or police superintendent Garry McCarthy can provide, Reuters reported, and called for Obama to return to his hometown. “When the president shows up, it shows ultimate national seriousness,” Jackson, a Chicago resident, said. Jackson first called for “immediate federal intervention and Homeland Security in Chicago” Friday after homicide totals surpassed 45 for the month of January alone.